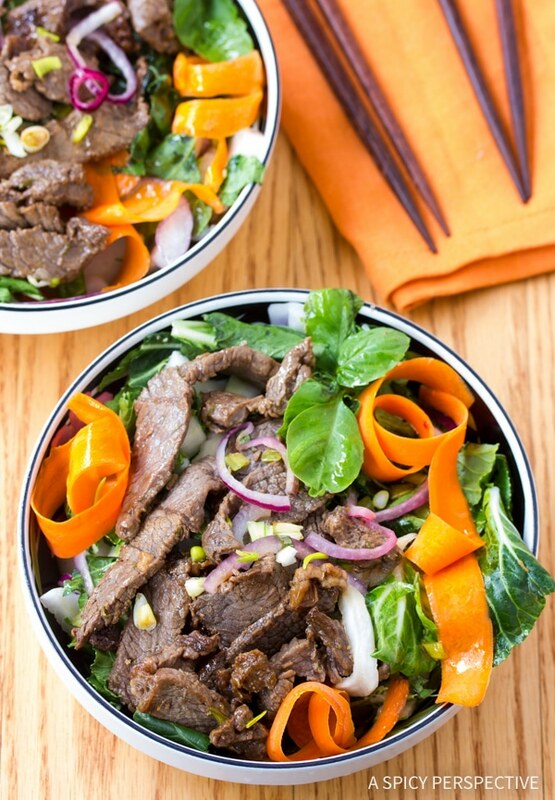 Amazing Asian Beef and Bok Choy Salad, packed with flavor, yet easy on the waistline! As I was preparing dinner one evening, I opened my bottle of fish sauce and was slapped in the face with a pungent reminder that things are not always as they seem. You’ve heard the old saying, don’t judge a book by it’s cover. I ‘d like to add to this train of thought, and share a profound new quote for all to ponder… Don’t judge a sauce by it’s smell. I know, I know. This goes against your better judgment. Conventional wisdom says milk, herbs, oil, and pretty much everything else, should be thrown out if it smells bad. Yet with fish sauce, the more putrid and filthy it smells, the better the fish sauce. And let me tell you, mine truly provides a heinous stench that fills the kitchen. Fish sauce is a wonderfully flavorful ingredient, used all over Eastern Asia. 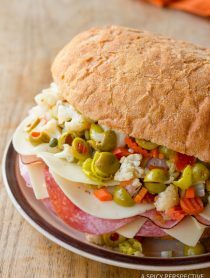 It adds a distinct savory essence that can not be replicated with any other ingredient. The smell diminishes as you cook it, leaving a strong but appealing aroma. The fact is, if you have ever eaten good quality Southeast Asian food, it’s almost certain you’ve unknowingly eaten fish sauce. It is a widely popular condiment for adding depth of flavor, used in many countries, especially in Vietnamese and Thai cuisine. It’s easy to get comfortable with what you know, and never allow your horizons to be broadened. One of my favorite parts of teaching my old cooking class, was hearing a person say they enjoyed a dish we’ve cooked; something they previously believed to be inedible. All I ask is that you try to be open-minded after opening a bottle of odorous fish sauce. Who knows what this new receptiveness might lead to! 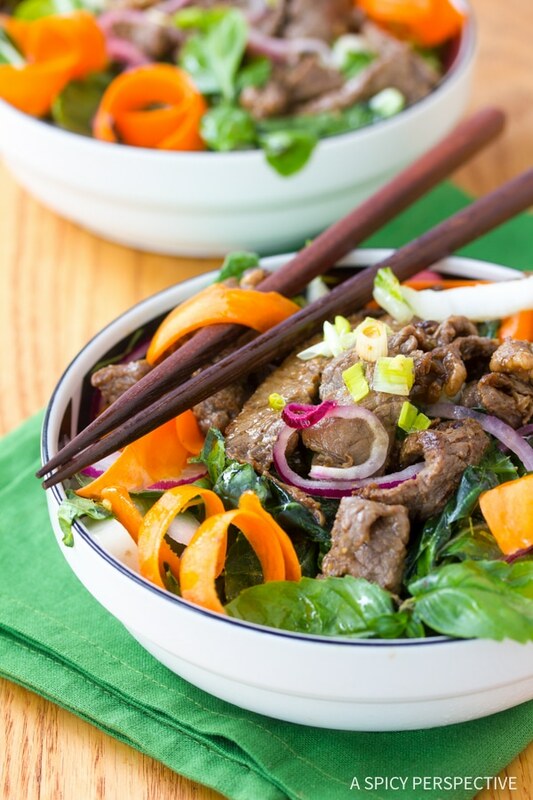 This vibrant Asian Beef and Bok Choy Salad is a fabulously low carb and low fat dinner that showcases the intrigues of fish sauce. Asian-style tacos are really trendy right now. Try putting Asian Beef and Bok Choy Salad inside wheat tortillas! 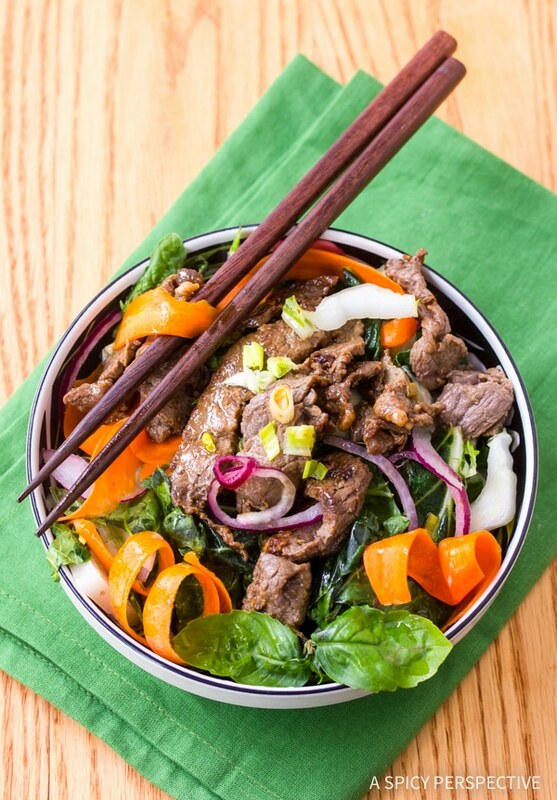 Asian Beef and Bok Choy Salad - Light, low carb, and full of poppy Asian flavors. 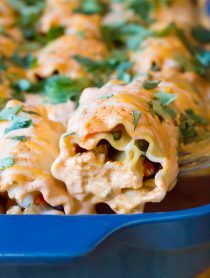 This healthy dish makes an amazing dinner for those on lower carb diets. Partially thaw the beef sirloin (or if it’s fresh, flash freeze it for 30 minutes) so that it is still firm, but a knife can cut through it. This helps to keep the meat from moving around while cutting it thin! Cut the sirloin in half, length-wise. Slice each half into very thin (1mm) pieces. Mix 2 tablespoons of scallion whites, lime zest, ginger, garlic, fish sauce, soy and sugar in a medium bowl. Toss in the raw sirloin and allow it to marinate for at least 30 minutes—but up to 4 hours. In a small bowl, mix together the peanut oil, lime juice, 2 tablespoons scallions, chili sauce, salt, and sugar. Whisk the dressing well. Cut the green leaves off of the bok choy. Hand-tear them into bite size pieces. Then thinly slice the white stalks of the bok choy. Place both on a large serving bowl. Slice the red onions very thin. Using a veggie peeler, shave the 3 carrots to make carrot ribbons. Roll the basil leaves tightly, then slice them into thin strips. Sprinkle all the veggies on top of the bok choy. Drain the marinade from the beef. Heat a wok or large skillet to high heat. Add 1 tablespoon of oil and wait until it smokes. Then add half the beef to the wok—stirring continuously. Cook for 1-2 minutes until desired doneness is reached. Then repeat with the second half of the beef. 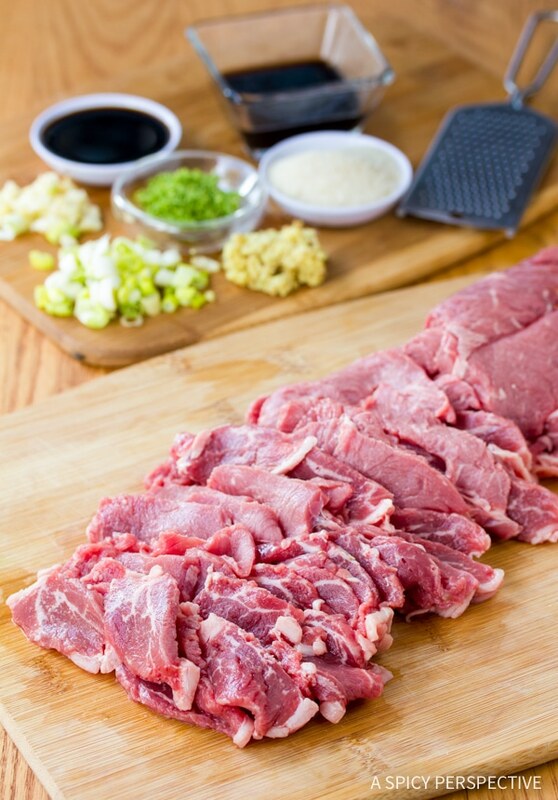 Once the beef is cooked, toss the salad with the dressing and top it with the stir-fried beef. Serve immediately. I might give it a go. I’m sure my house has smelled worse than a little fish sauce. :) Between the husband, teenage son and two dogs, not to mention all the garlic we LOVE to cook with. Thanks for sharing! I’m so glad you brought this recipe around again because I never saw it the first time and I LOVE it. 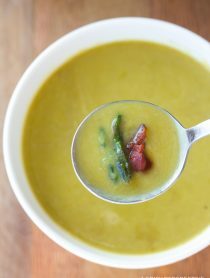 I’m a huge fan of all those ingredients (fresh ginger makes me swoon). I’ll be making this for sure. Very true about fish sauce, lol…Great looking salad! I hear you on the fish sauce smell…I often end up using soy :). Looks so so so YUM!! 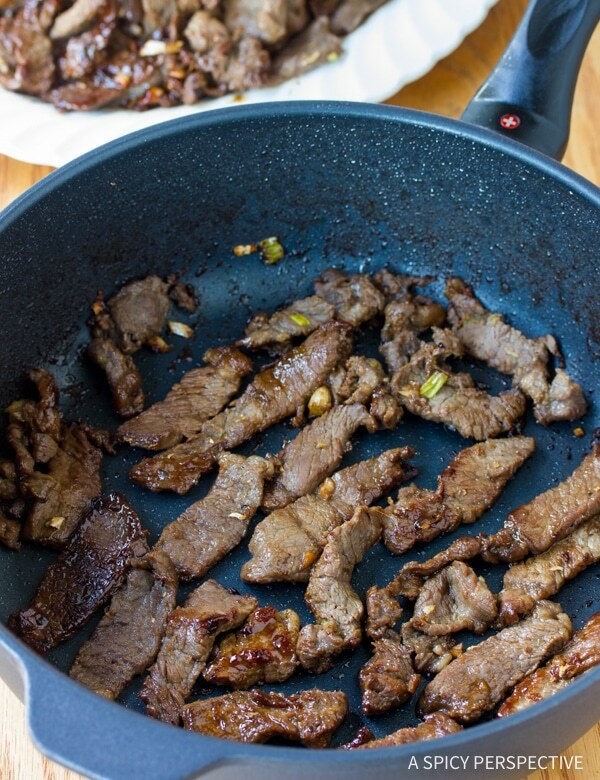 Sirloin stir-fried with fish sauce…wow that’s one totally flavoursome combination. I love it! I’ll be honest, I’m a little skeptical, but I’m trying to break outside of my box and this might just be the way to do so :) Thanks for sharing! The salad looks so good. Looks delicious! I love Bok Choy! Great pictures as well! I WANT TO JUMP ACROSS THE ROOM WITH THIS DISH! It is so perfect. And photographed so beautifully, too! I dont think I’ve tried stir fried beef with fish sauce but it looks really good. I must say I use fish sauce very sparingly. A bottle of it lasts forever. I love steak salads. I love Asian food. What’s not to love about your salad?! Sounds great. I am glad you reposted this one. I have to admit that I don’t have fish sauce in my kitchen…that’s how refined I am in tastes :( but I think you just made me want to buy it because this recipe looks simply fantastic. Look at that well seasoned WOK!! The ever-so-perfect slices of beef look very chic, and I love the background table used, the contrast in colors are PERFECT! OMG, that looks excellent. Great photos! Oh, fish sauce – yeah, when it’s used right, mmmmmmmmmm. It looks so good. I don’t like the smell of fish sauce either. I agree that sometimes old recipes need to be highlighted for new friends to see :) This definitely looks like a light and delicious meal. Heavy in protein and flavor! Wow! I love this. I remememer my first whiff of fish sauce–not a pleasant experience! But like you say, it really can’t be judged by it’s smell. With such a stink, it’s hard to believe that it can incorporate such great flavor. Mmm, I am very glad you pulled this one out of the shadows because it looks delicious. I bought bok choy once and was pretty stymied on how to use it all up, so this is a wonderful recipe. I totally agree about fish sauce! I made hamburgers once with it and it was really one of the best burgers I ever made! I love your quote “don’t judge a sauce by its smell”. Very true. What a great salad idea with lots of Asian flavors! Thanks for sharing. Ah, the chopsticks are crossed! I hope you’re not superstitious :D. Anyway, my mom would love this salad. Thanks for sharing! Ooo…this looks wonderful with great deep flavors. I can see why you reposted this! 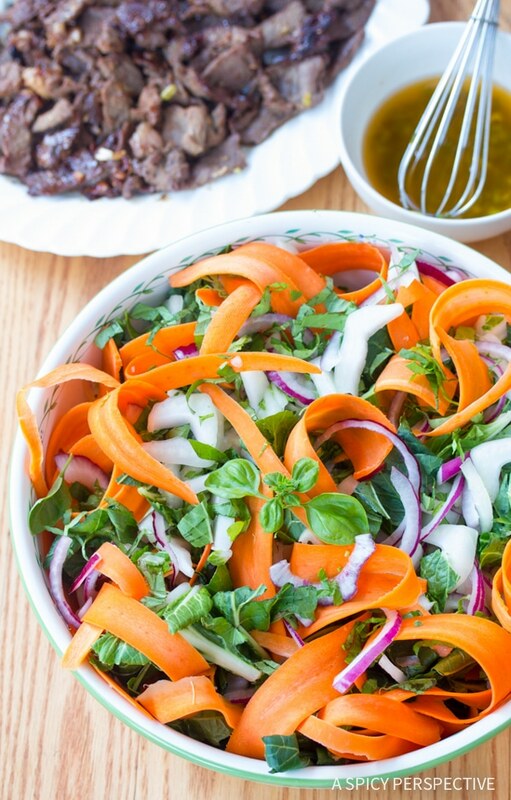 I love these kind of salads…and now I know what to do with our leftover flank steak! Mmmmmmm…. I’ve never been brave enough to use fish sauce, but I’ve heard of its miraculous cooking qualities. This looks awesome! May have to give it a try. Great looking salad! A nice spring dish! I’ve been wanting to cook a few Asian inspired meals! Thanks for the reminder recipe Sommer! Haha, yes, fish sauce smells terrible at first, but it is a fantastic ingrediant! Oooh I’m glad you featured this retro recipe. I love fish sauce, though after I saw how they made it on one of Anthony Bourdain’s show I was like maybe I don’t… But it does add so much flavor! This is just in time for summer. This looks great! I like the idea of putting it in tortillas, too. Just stumbled upon your blog via Maris’ @ InGoodTaste. This looks fantastic. I love a good Asian salad, somehow the flavors feel more filling, savory, and indulgent then a regular ol’ salad. Yum! Congratulations on the feature at Tasty Kitchen! Thanks for the tip about freezing the sirloin first. Great tip! What great photography. It looks delicious. Your blog is so cute and I love your pictures! This dish looks fantastic! This looks DIVINE. Oh my word!! I’ve never used fish sauce, but I might have to try it now. I’m not into beef but thrilled to see this post, because I didn’t know Bok Choy was good eaten raw. Thanks, Spicy! Fish sauce is an amazing thing isn’t it? I try not to think about it too much. Once I saw a show on how it’s made… I’ve tried to erase that from my memory. Also, this dish looks amazing! I would love to have some for lunch. Sommer this looks so good! One of my favorite things to order at Thai restaurants is the Thai beef salad, but this looks so much better than anything I’ve ever ordered! So many good things going on in here — delish! This looks nothing less then delightful, I might need to sample a dish with this type of sauce now. You have me intrigued. Thanks for this!!! I tried cooking with fish sauce a couple weeks ago, must not have cooked it long enough, or used too much… because I could really taste it. I will not give up on it though thank you!!! I like my fish sauce the smellier the better too! Heehee, vintage. I like that! YUM.